Home / Help / Israeli-Palestinian Faceoff - on a Welsh Mountain? 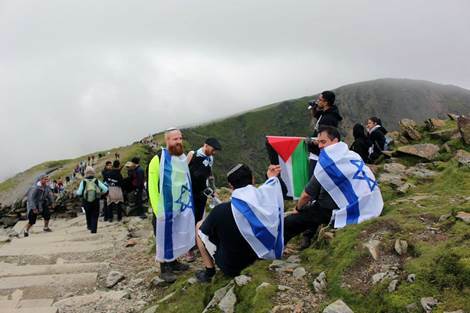 Israeli-Palestinian Faceoff - on a Welsh Mountain? When a group of intrepid Israel activists got wind of a pro-terror charity fundraiser, they decided to act. What happened next was surreal. Now that's commitment: When a group of British pro-Israel activist got wind of a fund-raising event for a terrorist-linked charity they decided they had to act. Dozens had already signed up for the fundraiser for Interpal, a charity which is banned in the US for funding Hamas, but which is still legal in the UK, despite Hamas also being a proscribed terrorist group there. Hamas is responsible for the murder of thousands of Israelis and the maiming of many more, mostly civilians. Its charter details its commitment to the destruction of the State of Israel and the ultimate genocide of the Jewish people. Joseph Cohen, founder and leader of the Israel Advocacy Movement, decided to arrange a counter-protest in response. 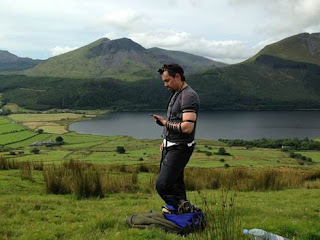 A simple enough task - except the fund-raiser was a hike up the highest mountain in England and Wales, Mount Snowdon. But that didn't deter the half-dozen Israel activists who, together with Cohen, schlepped all the way from London to Wales for a mountaintop showdown. 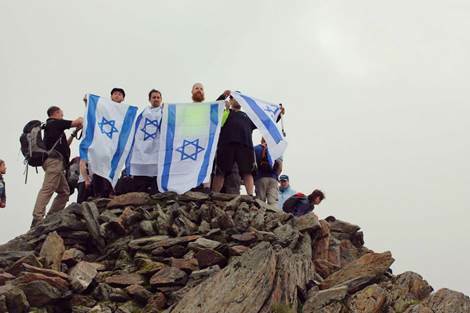 They decided the most appropriate response would be to dedicate their own hike to the One Family organization, which helps survivors of terrorist attacks and bereaved families deal with their physical, psychological and emotional wounds. However, not wanting to tip-off the pro-Palestinian group, they only announced their own fundraiser after the event. We had no idea what to expect, all we knew was that attending anti-Israel demonstrations and climbing mountains are dangerous in isolation - but combined this seemed like a suicide mission," Cohen recounted in a post on IAM's Facebook page. 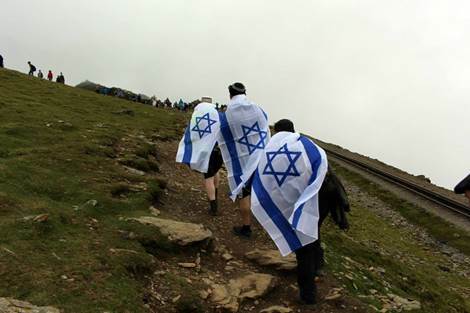 "As nobody in our team lived near Snowdon we had to travel 13 hours and stay in Manchester for Shabbat. 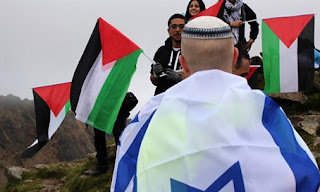 After effectively two days of travelling we finally arrived at our destination and after a ferocious three hour climb we reached the peak which was awash with dozens of Palestinian flags." But rather than confront their far more numerous, somewhat bemused opponents, Cohen's group went for a different tactic. 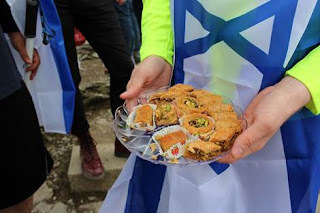 "Adorned in Israeli flags and dwarfed in numbers we decided the best way to ensure nothing violent happened (the nearest police station was a long helicopter flight away) was to approach their camp and offer them baklava. Providing us with the opportunity to engage them and promote Israel. 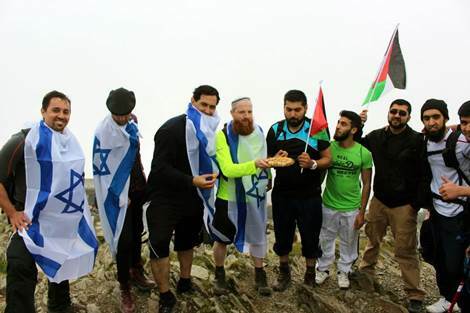 "What followed was a very surreal group photo, while bewildered British climbers tried to make sense of a mountain that now resembled an Israel/Palestine peace summit." Cohen added that "almost all" of the pro-Palestinian activists said they supported "Israel's right to exist," while noting the irony that the "charity" they were collecting for backs a group bent on the Jewish state's destruction. "Even the t-shirts they'd given their climbers displayed a map of "Palestine" where Israel is today." Speaking to Arutz Sheva, Cohen said his group had four objectives in their trek: to highlight Interpal's nature as a terrorist-sponsoring group, to ensure passing tourists would receive both sides of the narrative, to raise money for Israeli victims of terror - and to engage with their opponents in a manner usually impossible within the context of a "conventional" protest. "We chose to engage with them on a mountain as most pro-Israel activists only interact with pro-Palestinian activists at demonstrations and highly politicised events," he said. "This attracts a particular type of activist (on both sides) and it tends to be more of a polarised environment. "A fundraising event attracts a much broader audience. While it may still attract BDS hotheads, it will also attract well meaning people that just want to help others they perceive to be in need of their help. We wanted to approach these individuals and share the Israeli position as so few of them are exposed to it. "We also realised that the mountain could be busy as it was a bank holiday and we wanted to connect with the general public and ensure that Israel's voice was heard - which it was." Ironically, he said the only negative reaction his group experienced was from "a European climber who wasn't happy to see Israeli flags on Snowdon." Cohen, whose often solo efforts to counter hostile anti-Israel events have gone viral, said he was overall pleased with his group's efforts, but lamented that a lack of passion was causing the pro-Israel movement to fall into a state of lethargy. In a sense, the Zionist movement was in danger of falling victim to its own success, he warned. "I believe the Pro-Palestinian movement is deeply passionate about their cause... they are deeply committed to establishing a state (like the early Zionists). They have also been deceived into believing the Palestinians suffer the worst conditions in the world, which creates a sense of urgency to their cause," he said. "In contrast, British Zionists have become complacent. We have a state with a military to defend it, we have a high standard of living, a booming economy and, thank God, gone are the days when hundreds of Israelis were being massacred each year. "So British Zionists have got lazy, they share content on social media and give to charities, but they're comfortable leaving the hard work to others." But he added he believes it's a challenge which can be overcome - if only people put in the effort. "This is the biggest challenge British Zionism faces. Much of the general public has been indoctrinated into opposing Israel... We need to find the energy and courage to get out of our armchairs so that we can give a voice to Israel and counter the wave of anti-Israel sentiment that is sweeping across the UK." He says the greatest mistake pro-Israel groups tend to make is to focus their efforts on lobbying politicians and policy-makers, while abandoning the playing field to the other side when it comes to the equally crucial battle for public opinion. "While most of the Zionist institutions focus their energies on ensuring that the Israeli narrative is heard in the hallways of Westminster and to individuals and institutions with influence, we have lost the average man on the street," he claimed. "To win him back we need to actually speak to him, to connect and engage with him and to shatter the lies that he has been fed." Or, perhaps, to feed him baklva instead.